We recently published an article in National Wildlife magazine on the enormous, unnatural toll that free-ranging domesticated cats take on wildlife, along with a blog post about how to keep indoor cats happy and healthy so they don’t need to go outside. If your cat goes outside and you can’t keep it indoors — which is the only 100 percent effective way to keep birds and other wildlife safe from cats — there are some things you can do to minimize the chances of it hunting wildlife. Even if you keep your own cats indoors, your neighbors might not, or you might have feral stray cats in your neighborhood. If you participate in our Garden for Wildlife program and have created a wildlife habitat garden for birds and other backyard wildlife, it is understandably both concerning and frustrating when cats show up and kill the wildlife you’ve worked so hard to help. Here are some tips for keeping backyard birds and other wildlife safe from free-ranging domesticated cats. It bears repeating that the only way to keep birds and other wildlife safe from domesticated cats is to keep cats indoors. All of the other tips on this list are only going to be partially effective, and only address the symptoms, not the underlying problem of the negative ecological impact that our domesticated cats have on wildlife. Remember, it’s not the fault of the cats, which are just following natural instinct, but rather an extension of human impact on our environment. We created domesticated cats and have imported them around the world in places they don’t belong and in numbers that often far exceed the numbers of native predators. It’s up to us to prevent and solve the problem. Birds and other wildlife naturally use dense vegetation to hide from predators. A bare lawn doesn’t offer any cover. When you’re designing your garden or landscape include dense plantings of shrubs or trees, or a meadow or wildflower garden, where wildlife can hide. If you use native plants, not only will they provide cover for birds, they’ll also offer food sources and nesting places. Our Garden for Wildlife program has more tips on how to provide cover for birds and other wildlife in your yard. Birds and small wildlife need cover and hiding places from cats, and at the same time they also need some open space around feeders and birdbaths to be able to spot cats before they get close enough to pounce. Place feeders and birdbaths at least ten to twelve feet away from any potential hiding places for cats. If outdoor cats are staking out your bird feeders as hunting grounds, the responsible thing to do is to take your feeders down to protect the birds. Focus on feeding birds naturally through native plants that provide seeds, berries and insects. Native plants won’t cause birds to congregate in high numbers in one spot every day like a feeder does, which is what attracts hunting cats. One of the oldest tactics to keep wildlife safe from cats is to put a bell on outdoor cats’ collars. Unfortunately, this doesn’t really work. The sound of a bell tinkling isn’t something that wildlife associates with predators or other danger. 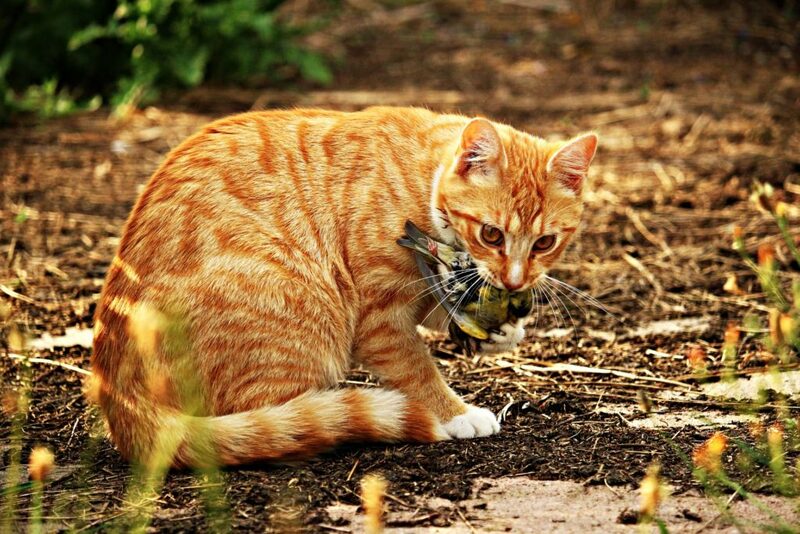 There are collars that have shown some promise in minimizing pet cats’ predation on birds. These collars rely on bright color to catch birds’ attention and so just like with bells, bright color isn’t something that wild birds associate with predators and many kinds of wildlife don’t even see in color, so as a result, these collars are only partially effective and aren’t a real solution, especially since they can foster a false sense that they are solving the problem of cat predation on wildlife. 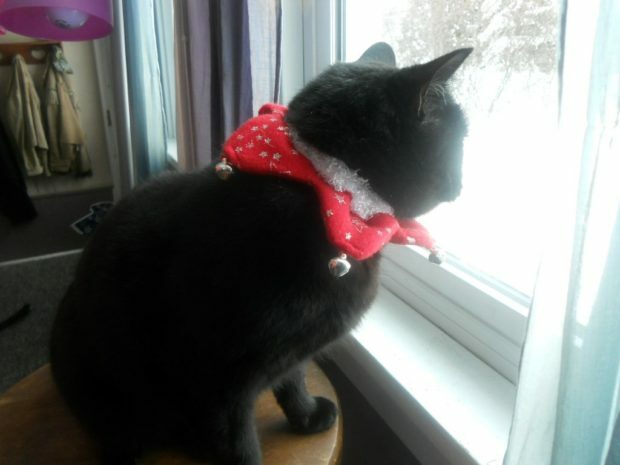 Mothballs are often also recommended as a deterrent to keep cats out of your yard. Not only is this not an effective long-term solution to keep cats away, mothballs are made of toxic chemicals that should absolutely not be broadcast out in your yard. Cats are natural climbers so a fence isn’t going to be totally effective at keeping cats away, but it can help. A six-foot fence is too high for most cats to jump over and most won’t be able to climb it either if it’s made out of smooth wood or vinyl (vs. chain link). Avoid plantings right up against the outside of the fence, which cats will use as ladders to get over the fence. Like fences, motion detector lights aren’t going to be 100 percent effective at deterring outdoor cats either, but they can help. The sudden bright light can spook cats that show up in your yard. You can also experiment with motion detector sprinklers. A surprise blast of water is harmless but will make a big impression on roaming cats and teach them that your yard is a no-hunting zone. You’re an animal-lover and it’s only natural to want to feed feral stray cats in your neighborhood. While difficult, it’s best to resist the urge to feed stray cats. Feeding strays only exacerbates the problem of free-ranging cats killing wildlife. In the big picture, it’s bad for cats too. Stray cats live short, brutish lives and feeding them helps ensure that the stray population perpetuates itself and that more cats suffer from disease, starvation, and death from cars, dogs and wild predators. As a wildlife conservation organization, the National Wildlife Federation doesn’t support Trap, Neuter, Release/Return programs simply because they don’t work to minimize the negative impact of feral cats on wildlife populations. Feral cats are primarily responsible for the 1.3-4 billion birds and 6.3–22.3 billion mammals killed annually by domesticated cats in the United States and perpetuating feral cat colonies is incompatible with sound, science-based wildlife conservation. You should always spay or neuter your pet cats–especially if they go outside. There are millions of unwanted cats in shelters and running stray as ferals. Don’t contribute to the problem by allowing your cat to produce new litters. When you’re looking for a new pet, adopt from a local shelter or rescue group. Even if you don’t have a cat of your own, support efforts to promote spay, neuter and adoption programs in your community. It should go without saying that you should never abandon unwanted pets by dumping them into the wild. Often this results in the death of the pet from predators, starvation or exposure. Those that survive become part of the feral stray population that takes a major toll on wildlife. Instead, reach out to your community and find someone to adopt your unwanted cat, work with a local rescue group, or surrender it to the local shelter. Passions rise between cat lovers and birds lovers whenever the topic of domesticated cats and wildlife comes up. If you’re a bird lover, resist the urge to demonize cats and their owners. If you’re a cat owner, resist the urge to write off bird lovers and wildlife conservationists as cat-haters. Cats are not evil animals. The science is clear on the impacts of cats on wildlife populations. Both of those things are true. Giving into your emotions on either side only exacerbates the problem and doesn’t solve anything. The only way forward is to work together to solve the problem. Talk to your neighbors. Be willing to compromise. Share your knowledge and love of cats and wildlife to affect positive change in your community.